Add a touch of shimmer to your art and photos with this metal picture frame in a shiny silver. 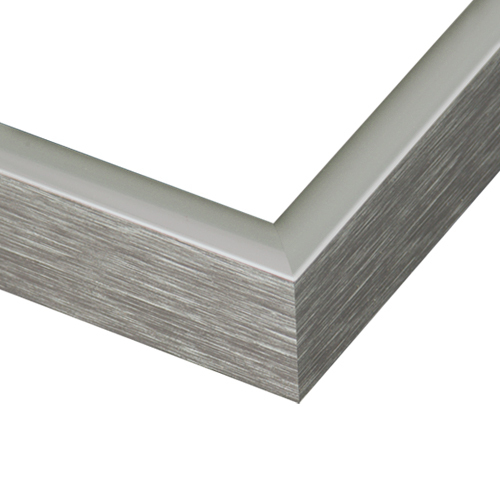 Its flat, square face creates a versatile and contemporary look, with subtle brushed outer edges. This affordable luxury is made in the USA. Customize your art even more by adding multiple mats to make a big statement in a small space. Spring-clips, wire & corner brackets are included for easy assembly and hanging. Satisfaction guaranteed. Metal frames were well-made and easy to assemble. The kit included everything I needed. Samples were helpful in selecting the frame style. And the frames look good. Y'all are a class act. Received on time. Very east to put together and looks great. This is probably my 15th or 20th frame from this company and i'm always happy with the results! 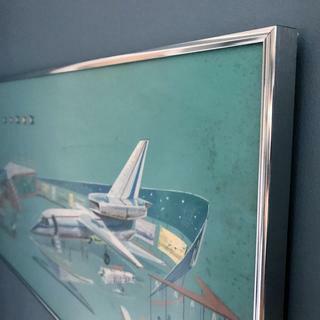 I bought this frame to complete a cool, 1960's hand painted 'airport' print. This is so much more affordable than buying custom frames locally. I do have a comment: this picture is hung in a bathroom over a bathtub, so I ordered the non-glare acrylic instead of glass. I have noticed that as the bathroom heats up during a shower in wintertime, the material makes faint creaking/settling noises. the only issue I had was the corner plates, instruction to put stamped side a certain way was missed by me or not clear. Had to redo several corners. hangers and wire were perfect to complete job. I would recommend your company/products to others. Thanks for prompt service and quality profuct - poster looks great! Their a perfect match to the 2 or 3 dozen frames I bought at the old mall store, in the big city, back in the '80s and '90s. The frame itself looks cheap - I feel like it would have been better to buy a nicer looking frame and do it myself. Hello Rachel. Thank you for your honest response. We regret the frame does not suit your needs. We are more than happy to offer you a full refund. Please give us a call at 1-800-332-8884 so that we may offer you a prepaid UPS label. We look forward to making this right with you. Have a great day! It works well with x-ray photos...It lets the art stand out. Matched frames already in our display. I knew what I wanted but no one local had it. These are great, simple frames, easy to assemble and look very clean with my artwork. I've been using them for years and have always been happy with them. How do you put this together? BEST ANSWER: Thank you for reaching out to us! This metal frames pieces together using a corner bracket system. You will receive two brackets per corner. The two piece screw together to help tighten the corner of the frame. Once three of the four pieces are together, you will simply slide in your backing, artwork, and acrylic, then place your fourth piece of frame on and tighten. We are always happy to assist you in piecing your items together. Our framing experts are here to help Monday thru Friday and can be reached at 1-800-332-8884.